Pablo Picasso’s love life is extensively documented by art historians. In short, there were ups and downs to being his muse. It seems to me the trouble gets the vast majority of ink. 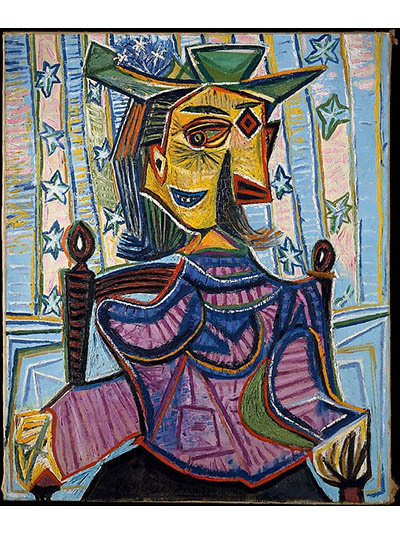 What is less well known about Picasso is that like many men in history, he made up after an argument with at least one of his lovers by presenting her with jewelry. The pattern began in the late 1930s. While walking along the Seine in Paris, Picasso got into an heated discussion with Dora Maar over the fact that she encouraged him to trade a painting for a ruby cabochon and agate ring. Well, the fiery Maar basically shut him down by taking off the piece of jewelry and throwing it in the river. According to James Lord, who recounted the scenario in his book Picasso and Dora: A Personal Memoir, Maar seriously regretted the hasty disposal of the ring. She returned to the the river, while it was being dredged, day after day to try and find it. When it didn’t turn up, she nagged the artist incessantly about the loss of the jewel. Ever the creative, Picasso made Maar a very special replacement. He found a costume ring and painted a tiny portrait of Maar in his Cubist mode for the center. This piece was followed by several other jewels Picasso created for Maar during the course of their tumultuous eight-year long relationship. 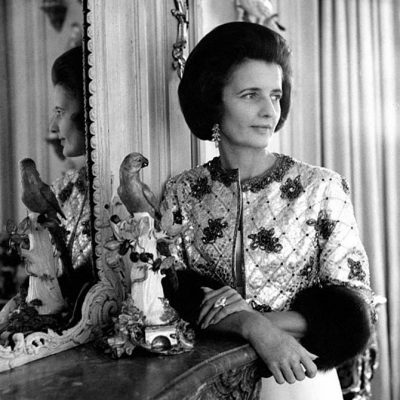 The jewelry collection was sold along with a cache of paintings in Maar’s estate at Paris Maison de la Chimie by the PIASA auction group in 1998. The history of all the jewelry is beautifully documented by Cathleen McCarthy on her blog, The Jewelry Loupe. 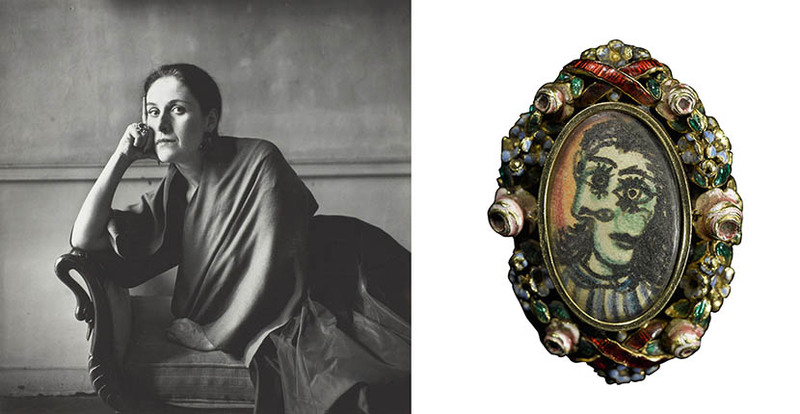 Now the portrait ring, that is officially called Bague de forme ovale, Portrait de Dora Maar is being sold by the owner who bought it from the original sale at Sotheby’s in London on June 21. 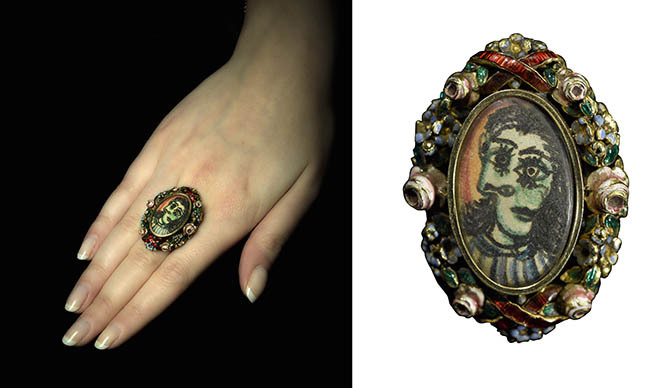 The portrait in the ring makes it the most beautiful piece among the Picasso jewels in Maar’s collection. While it has not been confirmed, it looks like it might be the jewel Maar is wearing in a 1948 sitting with photographer Irving Penn in the composition above. 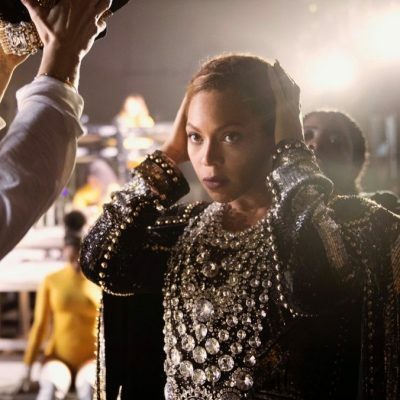 The estimate for the jewel is approximately $380,000 to $630,000. It is part of a special sale titled Actual Size: A Curated Evening Sale. All of the works in the catalogue are printed in the publication actual size. The Picasso ring is the only jewel in the offering of 35 lots of art. “We like the idea of breaking the addiction that much of the art market seems to have developed that bigger is always better.We want to reanimate connoisseurship in different ways, in this case by focusing on exceptional works on an intimate scale,” say Thomas Bompard and Allan Schwartzman, curators of the Actual Size sale. In other words, Sotheby’s is proving small is beautiful for the art crowd, a fact jewelry lovers know.